She'll be the first star you see tonight in this cute Stella McCartney Kids™ Twinkle Star Print Pleated Skirt. Smocked, stretch waist, A-line skirt. Circle skirt construction. Star print throughout. Smocked, ruffle hemline. 60% silk, 40% cotton. Machine wash cold. Imported. This item may ship with an attached security tag. Merchandise returned without the original security tag attached or a damaged tag may not qualify for a refund. Measurements: Skirt Length: 15 1⁄2 in Waist Measurement: 21 in Product measurements were taken using size 12 (Big Kids). Please note that measurements may vary by size. 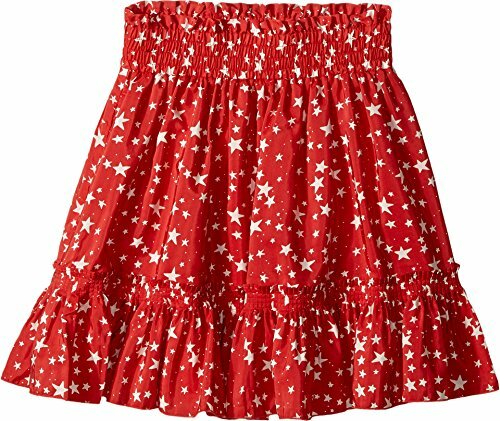 She'll be the first star you see tonight in this cute Stella McCartney Kids™ Twinkle Star Print Pleated Skirt. Smocked, stretch waist, A-line skirt. Smocked, ruffle hemline. 60% silk, 40% cotton. Machine wash cold. Imported. This item may ship with an attached security tag. Merchandise returned without the original security tag attached or a damaged tag may not qualify for a refund. Measurements: Skirt Length: 15 1⁄2 in Waist Measurement: 21 in Product measurements were taken using size 12 (Big Kids). Please note that measurements may vary by size.